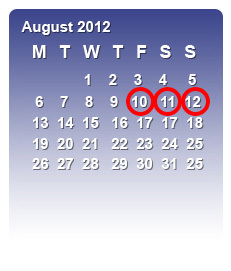 Will Run From Friday 10th August to Sunday 12th August 2012! 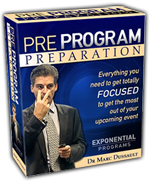 The Exponential Internet Marketing Bootcamp is a rare opportunity to work with The Exponential Growth Strategist, Dr Marc Dussault. this is the LAST INTERNET BOOTCAMP EVER. ...A hand-picked collection of reference materials you will receive as soon as you reserve your ticket. The Pre-Program Preparation™ materials are designed to help you grow your website or online channel sales BEFORE you step into the room at the Bootcamp! These "No-B.S". grounding materials have, on their own, delivered hundreds of thousands of dollars in sales to hundreds of entrepreneurs just like you. 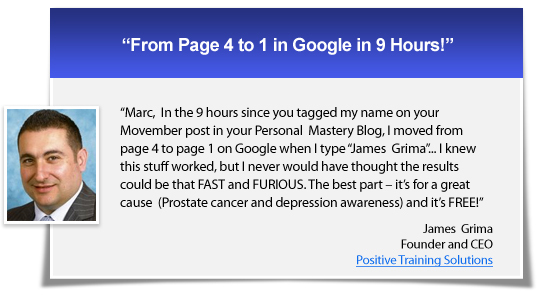 The "self-paced" nature of the program means your results are only determined by how much you TAKE ACTION on all the techniques, strategies and secrets you'll discover. The second component is even more valuable - it's "The Main Event"
The Re-designed, Re-engineered and Rebuilt Intensive 3-day Exponential Internet Marketing Bootcamp. Download the full-colour Bootcamp Brochure Now! 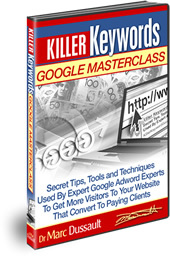 In this fast-paced 3 hour AdWords MasterClass you'll discover "Black Belt" AdWords strategies that 99% of your competitors don't know... strategies that mean you'll pay LESS for every click than them while generating far GREATER response and cashflow. The simple (paint-by-numbers) guide to the different types of TRACKING available -- how to set it up and make sense of the results without the use of a dictionary or thesaurus! We promise to speak plain, everyday English without the use of popular TLAs (Three Letter Acronyms). You won�t need a calculator, thesaurus or English-Geek dictionary. All the concepts, tactics and tips will be explained with full-size slides that will be easily legible from your seat. All case studies used will be real and not �extreme cases�, rather they will be realistic examples of �average� returns that you can expect to create when deploying these strategies in your own Google Adword account. The primary purpose of this presentation is to make sure your whiz kid/ webmaster never, ever pulls the wool over your eyes ever again with flimsy excuses and empty justifications you can�t understand. The majority of people don't make any real money on the Internet because they keep doing all the wrong things for all the wrong reasons - consistently. So they keep getting bad results time after time. You need a better way to create more income for yourself with less effort -- and attending the Exponential Internet Marketing Bootcamp is the ideal way to do that. You'll never catch the sunset if you keep running toward the East. Yet 95% of people on the Internet keep running East! I know. You've heard those rags to riches stories before. You tell yourself they can't be true. If they were true, you'd have to face the REAL QUESTION: Why aren't YOU doing the same? If you're an ambitious individual, you have probably attended one or more "make-money-online"seminars by now. Maybe you make a habit of attending every FREE Internet seminar in town in search of the one idea that will be the breakthrough to wealth. This Bootcamp is not one of those events. Second, it's not going to make you a millionaire overnight. These are legitimate, proven strategies for real businesses like plumbers, dentists, engineers, butchers, bakers and gyms that sell real products and services. Do you like the stories you hear from stage?... "high-school drop outs, a guy with a bullet in his leg, a very average husband and wife team, a guy who failed English class, a failed business man and husband, a failure in life"- sure makes for fun stories, but can they help YOU create YOUR OWN ONLINE SUCCESS? That's the question YOU need to ask. This Bootcamp answers the question with a resounding YES! 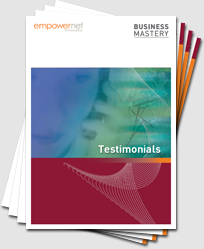 - just read the testimonials. This Internet version of the Bootcamp follows in the tradition of the classic Bootcamp that has produced more than 1,000 testimonials of Australians just like you who have taken ideas, distinctions, tips and techniques and applied them to their online and offline businesses. What if all you're missing is just ONE piece of the money-making puzzle? The Bootcamp has been extended by an extra 12 hours devoted to workshops to make absolutely, positively sure you know exactly how to apply your newly-acquired skills, strategies and techniques IN YOUR BUSINESS. Finally, the Q&A Rapid Fire Q&A Sessions will be expanded significantly so you have more opportunities to get into the 'Master's Mindset' and have YOUR specific questions answered right then and there! These new enhancements make this a MUST-ATTEND event for ANY Business Entrepreneur who wants to get his or her web-based part of the business going and growing as quickly as possible. Excited About The Possibilities For Your Company? it's not as easy as you might think! How to "Reverse Engineer" your (internet) flight plan (this is the shortest path between where you are now and where you want to be). Discover how to differentiate, reposition and distinguish your website, product or service to make PRICE virtually inconsequential - EVEN in competitive, cut-throat industries. Learn how to make irresistible offers that your website visitors can't refuse. Learn to Up-Sell, Cross-Sell and Follow up-Sell to multiply profits from every visitor that comes to your website or blog. You'll learn to create the best headlines / propositions to use - simply "adapt and adopt" to suit your website, landing pages or blog. Increase your number of visitors that convert to clients. Increase your average transaction size. Increase the frequency of each purchase and the monetary value of each client. How to continuously identify and discover hidden assets and overlooked opportunities in your websites and/or blogs. How to mine cash windfalls each and every month from your suspect, prospect and client lists. The secret of building your online business on multiple profits sources instead of one single revenue stream. How to be different, special and advantageous in the eyes of your prospects and clients. How to create real value for your clients and employees to gain maximum loyalty and profitable results. How to gain the maximum personal leverage out of every monetary, time or energy investment you make in your website or blog. The importance of Networking, Masterminding and Brainstorming with like-minded, success-driven people who can share with you their keys to success and the mistakes to avoid. How to turn yourself into an Idea-Generator and Recognized Innovator within your industry, field or market so that people come to you automatically. Learn the 20 Marketing Mistakes Virtually Every Internet Marketer Is Making and how to avoid or correct them. 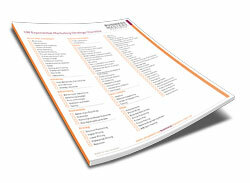 Growing the web-based part of your business is easy, once you know the 25 Ways To Out-market Your Competition. The 5 Keys To Winning Business in Australia and then anywhere else around the world. 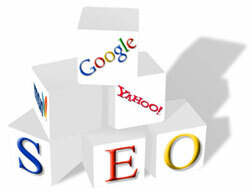 Learn how to get any mature business going and growing online to gain its online presence as quickly as possible. The concept of optimization and the Force Multiplier Effect. The 14 Key Mindset Factors you MUST master and how to implement them. You will learn the 25 MUSTS for every successful Internet Marketing Entrepreneur. Finally, you'll create your own Personal Action Plan to go back into your online business and take massive action to reap the financial and personal rewards. You will spend time at your table learning and testing the theory and translating it to your working reality. Every two hours, you'll change tables and start all over again with a new team of "MasterMinds" to help you craft your own set of 'Ultimate Strategies'. The MasterMind concept is unique - it's one of the foundational principles of the all the programs and events offered by Exponential Programs. 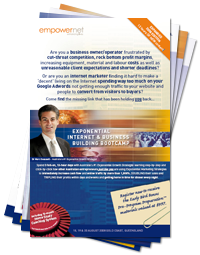 On the last day of the Exponential Internet Marketing Bootcamp, you will be able to calculate the specific, tangible improvements that this program represents to your online operations and sales. Others will share their insights for explosive compounded learning. This is by far one of the highlights of the Bootcamp. You'll be blown away at the innovative, creative and out-of-the-box ideas people come up with - ideas you can 'capture' and make your own! If you are prepared to commit and take action, these 3 days are guaranteed to change the online part of your business forever. The Bootcamp has been scaled down in quantity and scaled up in quality. Unlike previous years, there will be no 'discount' seats or 2-for-1 special deals. Every single person in the room will have paid for the privilege of being part of the experience. As a participant, you're looking for that extra 'edge' to get in front AND STAY IN FRONT of the crowd. As an attendee, you're looking to create at least $100,000 of new additional income to your personal or business bank account in the next 12 months. With the Exponential Mindset Thinking™, you know that acting strategically is MANY TIMES more powerful and financially rewarding that going for a quick one-time profit if it compromises long-term value and wealth creation. Join the legions of Business Entrepreneurs just like you who have turned the turbos on their online sales, all starting with the Exponential Internet Marketing Bootcamp -- you won't regret it. The only thing you'll regret is if you DON'T find out more and your competitor is sitting in your seat at the Bootcamp. I am inviting ONLY 20 People to attend this Bootcamp. THAT'S IT - ONLY 20 people can attend. Why only 20? Because that's the 5% I want to spend time with. People who are going to take action and make real money for their real business... Over and over again. I am speaking from experience - when I launched Jay Abraham Asia Pacific 3 years ago, the business model was 100% effort-based and included one annual event when we brought the legendary Jay Abraham to Australia. That was a lot of hard work and inconsistent (once-a-year) revenue. Now that percentage is more than 80% passive and 20% effort-based. If that's what you're looking for - you MUST attend this Exponential Internet Marketing Bootcamp - it's the ONLY chance you have to get access to these strategies for less than $10,000 and it's the LAST TIME we're staging an Internet Bootcamp. There are just too many unscrupulous spruikers out there peddling “get rich schemes” that will turn you into the next “Information Product Millionaire” as you work from home in your underpants and “make money while you sleep.” Sound vaguely familiar? Many of them come from overseas, rip people off and fly back home with no recourse for refunds and other complaints. The local promoters just wash their hands of it all and get more people into the next “multi-speaker” salesfest. I just can’t be associated with that kind of amoral behaviour. That’s why I am no longer promoting “Internet Marketing Events”. But don’t get me wrong – I am levering the Internet more than ever and teaching my clients the most potent and effective strategies. I have just decided to RESTRICT that access exclusively for my elite Platinum Program Members. This last Exponential Internet Marketing Bootcamp is the LAST chance you have to get access to the strategies, tips and techniques that have helped plumbers, dentists, engineers, consultants, retail and other ‘real brick and mortar businesses grow and prosper through the Global Financial Crisis, the worst economic downturn in recent times. Our programs have gone "upmarket" BECAUSE we want to deal with the very best, most committed and aggressive business leaders who want to win the game of business. They are willing to do what it takes to make things happen - so we charge them more AND give them MORE attention, service and value. That means we have LESS room and that means you lose out unless you act now to book your seat, you'll miss out. and the room was packed as tight as a can of sardines. This Bootcamp will sell out too, because we have fewer than 10 seats available to Non-Platinum Members, the seats will be snapped up maybe even without staging a single preview event... So if you wait, you may not get in. The 5% who are making money online, have stumbled across a formula, they keep following religiously. In fact, once you hear it, you'll miss it. It's that simple. So I'll not only repeat it until it sinks into your subconscious but actually make it automatic so you can use it any time to make cash on demand. That's why I want to invite you to experience this 3-day, hands-on Exponential Internet Marketing Bootcamp where I'll build online strategies right in front of your eyes showing you the exact steps I used to build several successful websites on a shoe-string budget without any staff. This is a by-invitation only event that is only for the elite of the business and Internet community - the 5% that make money. The 5% that do what works and STOP doing what doesn't. As a Bootcamp participant, you're looking for that extra 'edge' to get in front AND STAY IN FRONT of the crowd. 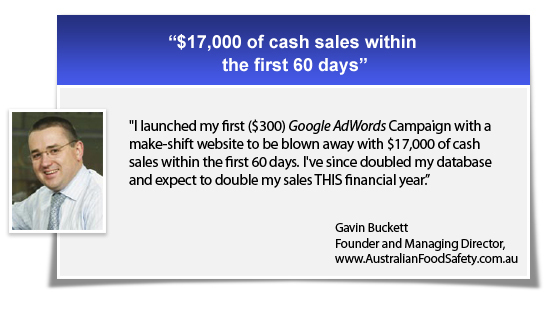 You'll discover the step-by-step and click-by-click the SECRET strategies the top 5% of Internet marketers use TODAY to flood their online payment gateways and bank accounts with cold, hard cash. Strategies that people of ANY age, ANY nationality, ANY race or skin colour, ANY scholastic ability can apply INSTANTLY the minute they get home. I'll also reveal how after the Sydney edition of the Bootcamp in August 2008, I wanted to prove to people that the bar can be raised as high as you want WITH A SHOESTRING BUDGET. I spent $60 and less than 30 minutes to increase the number of viewers from 240 to 320 per day... Now you have to admit you're curious. You do have $60 don't you? Would you know what to do to get that RESULT? That's why you need to attend the Bootcamp. You'll learn advanced strategies for generating FREE traffic to feed MORE visitors to your website(s). You'll also learn how to systemise and outsource your SEO strategy and engage low-cost contractors to implement them for you. Stop getting fleeced by some whiz kid who keeps telling you "it just takes a little time for these strategies to work..."all the while cashing your cheques week after week. The top 5% who make money know what works and what doesn't. When you purchase the VIP Ticket, you'll receive this eye-opening 90-minute Audio recording and 43-page transcript that will take you from novice to master so you can start to exponentially grow your online sales channel for your brick and mortar business. If you're not blogging, you're not going to get anywhere close to the top 5%. It's that simple. We’ve had 3 of our Platinum Program Members end up on national TV interviewed as industry experts BECAUSE of their blog. These are real business owners. Engineers, plumbers and retail shop owners who benefitted from $5,000 to $40,000 in FREE advertising, publicity and PR. You can and will spend hundreds (maybe thousands) of dollars trying to match this and other strategies – paying “SEO and Web Design companies and consultants to do it for you. Of course their goal is to charge you more and more… Not to save you time, money and effort. 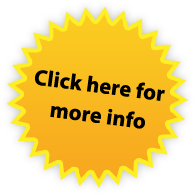 Most of the strategies we will teach you are FREE, they out-perform PAID advertising and you can do them yourself – think about it… Why would they tell you about them? They can’t afford to. They have to keep you in the dark, as long as possible. 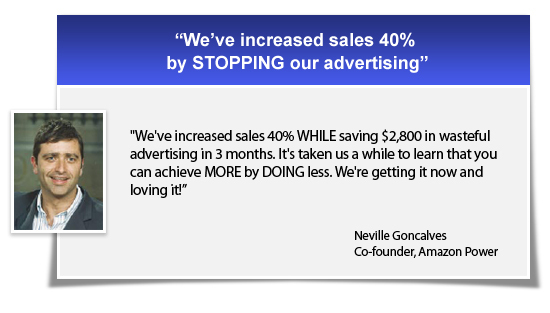 I am going to cover conversion strategies step-by-step, that produced 243% and 278% increases in sales INSTANTLY. You won't believe your eyes when I show you the actual report results. In one case, ONE ad was responsible for $42,100 in additional sales with NO change to the product. Say it with me.... Ka-Ching! This will be covered in depth on Day One of the Bootcamp and then repeated throughout the 3 days so that by the end of the event, it's ingrained in your subconscious so it becomes second nature to you - multiplying your response rates by orders of magnitude. The 95% that don't make money on the Internet have a 'herd' mentality - they do what everyone else does and expect a different result. I will spotlight 20 to 30 strategies that anyone can use to do things that are out-of-the-ordinary to create extra-ordinary results. The key is the word ORDINARY. This stuff is not rocket science. ORDINARY every day people can do them, just like the 5% who make all the money. The key is KNOWING WHAT TO DO AND HOW TO DO IT. I hear it all the time - I want to 'get on the Internet' to build a PASSIVE income stream... But only a few of us manage to make that truly happen. In less than one hour, I will reveal how you can replicate my success on a shoestring budget and with NO STAFF. This session alone is worth the price of admission. Consider it like a money tree that you can harvest whenever you need a little extra cash for a few luxuries. WARNING: This is not about becoming the next “Information Product Millionaire” or making money in your underpants. It’s about creating solutions, services and/or programs that your existing clients want to buy and delivering them electronically so that you can scale beyond the exertion of your personal effort. The Virtual Real Estate model is the future of Internet traffic generation strategies. At the Bootcamp, I will show you how you can develop a multi-tiered approach to traffic and lead generation that will blow your socks off. My clients and I have created portfolios of more than 300 Virtual Real Estate properties that now create “link juice” that fuels an ever-increasing traffic flow to our destination sites. This session has never been presented in THIS format, in THIS context. I will call it as I see it and will hold nothing back. I'll explain why putting an ebook on the net thinking millions of people are going to buy it is the most ridiculous business model ever promoted - it's The #1 Reason Why People DON'T MAKE MONEY ON THE INTERNET. 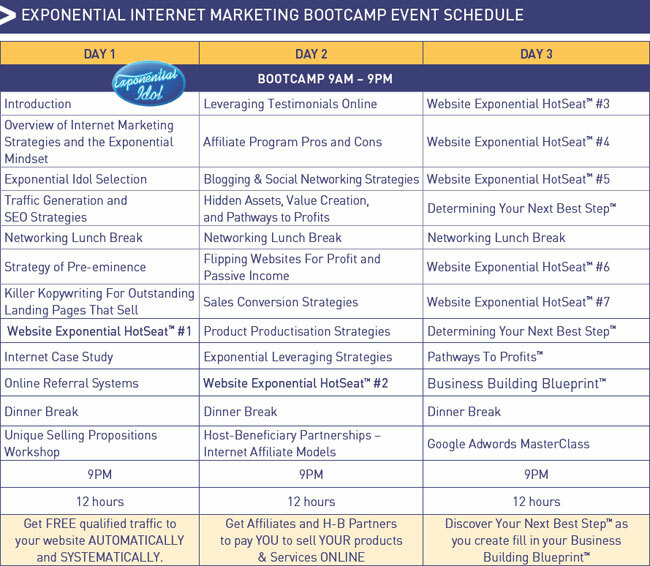 At the Exponential Internet Marketing Bootcamp, I will perform up to 4 HotSeat™ Website MakeOvers. These will be some of the many highlights of the Bootcamp. If you want YOUR website or blog to be completed re-designed, you need to purchase a VIP Ticket. As a HotSeat™ Website MakeOver participant, you will get the audio and video recording as well as the word-for-word transcript of the session PLUS you will also get feedback forms from all the Bootcamp participants as explained in the documents you can download by clicking on the icon here. Free information that circulates the Internet today is not free. It's costing you tens of thousands of dollars - in lost passive income, lost opportunity and overspending on traffic generation techniques that never bring you the results you need. That is why you need to attend this event - take EVERYTHING you've learned, gathered and collected up until this point and FINALLY turn that into CASH. Buy a Gold Ticket for $5,997. You attend all 3 days and evenings, can listen to every single word I speak and take as many notes as you can. Buy a VIP Ticket for $9,997 and catapult your profits sky-high by joining Australia's most elite Internet Marketers who make money on the Internet with on-going support for 12 months. The VIP Ticket comes with a $30,000 Results Guarantee. Click here to read all about it. With a $30,000 Results Guarantee, you have nothing to lose and everything to gain. “With a promised 300% return, these strategies have to work… Why wouldn’t I give them a go?”. Do nothing and lose out. Albert Einstein said it best "Insanity is doing the same thing over and over again and expecting different results." STOP the insanity now and learn the secret strategies of the 5% who make more than the 95% combined. I know I am repeating myself, but it needs to be hammered home. If you do nothing, you won't change your results. The investment in the Bootcamp is a drop in the bucket when you consider the recession and what it will cost you NOT to know what to do especially when cut-throat competition is at its all-time worst and not getting any better any time soon. I am not into fear mongering, but then again I am telling our elite Platinum Program Members what to do to profit in these turbulent times - there are several strategies we cover at the Exponential Internet Marketing Bootcamp - one of them is to do what others are NOT doing... Acting Antimimeticisomorphically. Imagine 22 separate BANKS paying you day AND night... a non-stop ULTIMATE money-making machine that never stops! So of course you can learn a thing or two from him, even if you consider yourself "knowledgeable"online. This is not a product available anywhere else - it's an exclusive bonus for premium clients on a preferential basis. This is only available to VIP Ticket holders. I will hand-pick a selection of secret case studies and reports that are never made publicly available. These contain dozens if not hundreds of ideas, distinctions and tips that can be deployed almost immediately - most of them cost nothing or next to nothing. All are exponential in that they leverage your time, effort and money to give you the best bang for your buck. They are not listed here and are a bonus that is the "cherry on top of the cream". This event is restricted to only 20 participants. If you're not sure about the value of the content I will cover, take 10 minutes right now and check out my blogs. That is the information I give away for FREE. If you're into FREE "sales-fest" events that pump you up and leave you wanting more, but deliver nothing, the Bootcamp is not for you. This is 100% pure profit producing content. As a VIP Ticket holder, you get thousands of dollars of bonuses that are worth MORE than the price of the ticket PLUS you get to attend the 3-day event. But this offer is limited to 20 people - book your ticket now or you'll miss out. Why would we LIMIT the number of seats? The room has been booked and there is no room for more than 20 seats... How does that make sense? Y'see with the RESULTS GUARANTEED programs we deliver, we have more and more people interested in what we have to say. Everyone else in our 'industry' offers the traditional 'money back guarantee'. 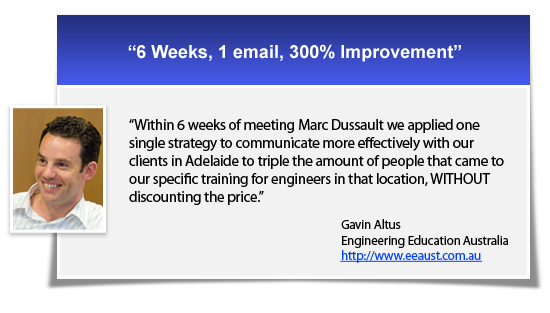 Did you know that 50% of people who buy programs at multi-speaker events RETURN them within the guarantee period? What does that tell you? Those programs and products don't work. Sure, they impress participants with a crowd at the back of the room, but the BARE BONES REALITY is that everyone loses. The promoter and the presenters lose because ill will is created and the participants lose because they didn't get what they wanted... Or did they? They wanted a quick fix that doesn't exist. They wanted a magic bullet to solve 'all their problems' instantly. I know that sounds harsh and it is. It's called life and that's the way it is. I however, have been in this industry with only ONE mission - to make sure that EVERYTHING I DO WORKS and that an ordinary person can implement what I teach and replicate my results - GUARANTEED. That is why I created Australia's (The world's?) first and only RESULTS GUARANTEED program - the Platinum Program. The value proposition for this event is so overwhelming that I am offering a guarantee for VIP Ticket holders. How's that for being Antimimeticisomorphic? How's that for bucking the trend? If you want PROVEN PROFIT-MAKING RESULTS, come spend these 3-days day with me. The only question is whether or not you'll get your share of that $20 Million? If you don't attend it won't make a bit of difference to me, but if you do attend, it will be a life-changing, business-shifting experience that you will remember for years to come to YOU. THAT I can guarantee. Don't take my word for it - read the testimonials, check out my website and see for yourself. If all of that doesn't convince you, nothing will. This is not for you. This is for people who know it works and will make it work. It's not rocket science. That's why the Internet's been said to be "the easiest thing that's hard to do". Most people don't know how to get started setting up a website or blog (one is much better than the other), don't understand the vocabulary (e.g. a website versus a landing page), nor do they know how to get traffic to their sites (Search Engine Optimisation, Pay Per Click, plus a host of other strategies...) and get fickle visitors to opt-in or take out their credit cards and buy. That's why you need to attend this 3-day Exponential Internet Marketing Bootcamp. You'll learn everything you need to know to get your sales going and growing on the Internet regardless of your current knowledge level - novice or otherwise. You'll soon be smiling as you start spinning profits into your multiple payment gateways, 24 hours a day, 7 days a week - even while you're on the playground with the kids. 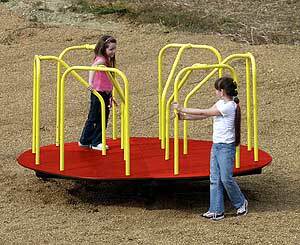 The first pull of the merry-go-round is the hardest. Make it now by attending this 3-day Exponential Internet Marketing Bootcamp. You'll soon be sitting pretty and glad you did. 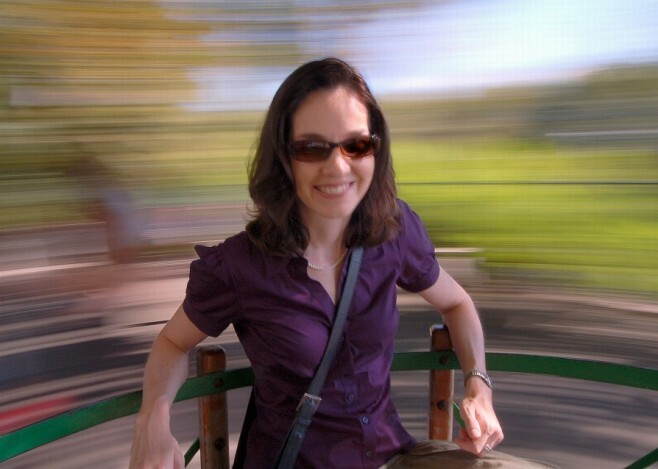 As you also know, once the merry-go-round is spinning, it's effortless to KEEP IT SPINNING. That's what we're going to teach you to do on the Internet - using autoresponders, blogs, on-page and off-page search engine optimisation, social networking and other FREE traffic generation strategies that will keep people coming to your sites, opting in and buying from you. 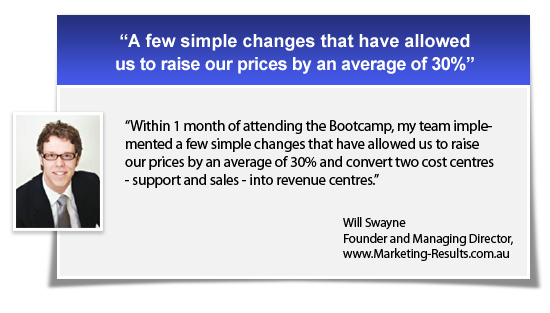 You need to change your approach and you need to attend the Exponential Internet Marketing Bootcamp.